Security Brief: Why won't my simple WCF service start when I run it as a non-administrator? Rant: Why make being secure so hard? The Hidden Boot Code of the Xbox or "How to fit three bugs in 512 bytes of security code"
Excerpt of the book "Know Your Enemy: Learning About Security Threats"
Been on holidays, at conferences (eg last week Ask The Experts @ XTOPIA in Berlin), and worked on various projects - a couple of reasons it was rather quiet lately in this blog. Caveat emptor: I am no designer (surprise!). But thanks to no design it should be easy for you to add your own design. However, as this month's MSDN magazine is all about security, I decided to make the application production-ready security-wise. You'll find a lot of parsing plus XSRF protection (note: this version does not check for integer overflow in calculating the start row). Missing features: this guestbook is not prepared for localization, nor does it use a control-based approach (where you drop those in your pages and get an in-place guestbook). 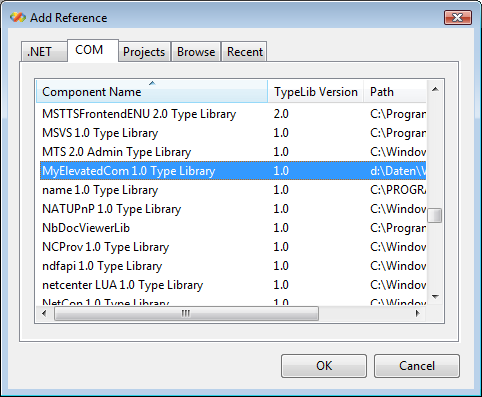 Update a version of this application for VS2008 RTM is available here. The latter is especially important if one fails to grasp how to turn the private key plus the certificate into the .pem for Stunnel. 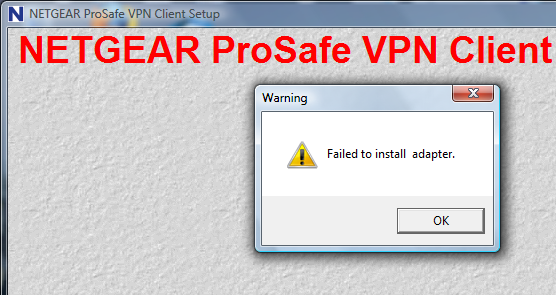 By the way, I was using CAcert. That works just fine for internal email servers. That site is actually quite clever though: when you go there the second time, it detects that it tried to infect you before and tells you that your IP is blocked. And it doesn't send a peep to a browser other than IE. Plus - and that takes the biscuit - it also verifies the referer. Although Fiddler has tons more features, this did the trick for me in this case (if you want to learn what Fiddler can do, look here). So what's the obfuscated script about? The short version: it is a variant of the ASUS download server drive-by download incident. The actual code can be found in a discussion on our German .NET community site here. Will UAC Affect Your Application? 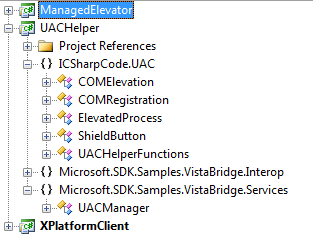 In my last blog entry UAC Elevation in Managed Code: A .NET COM Component Elevated I showed how to get up and running with an all-managed code solution for UAC and COM elevation. Today I want close out my series on UAC with some information on how to properly organize the project plus present a library you can reuse to get up and running quickly - without many of the manual and tedious steps from the previous proof of concept example. 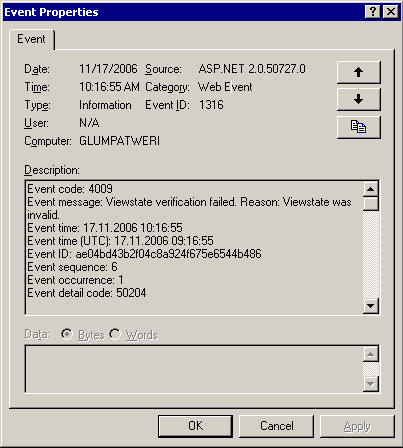 Note that on machines without the .NET Framework SDK, there is no gacutil.exe. In that case, you have to drag & drop ManagedElevator.dll to c:\windows\assembly. COMRegistration Used by the elevated component to automatically register the necessary registry keys. ShieldButton Used by the client to display a button with a shield icon (on Vista). For XP, no shield is rendered. 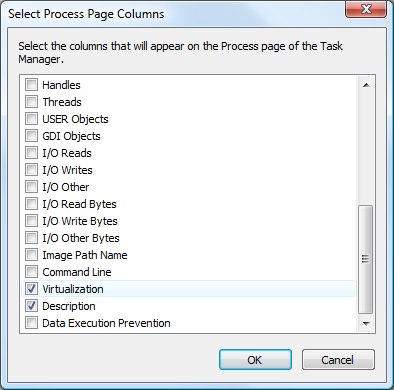 COMElevation Starts the requested component with admin privileges. ElevatedProcess If you want to start a simple process elevated. Not used in this guidance. Let's look at these one by one. 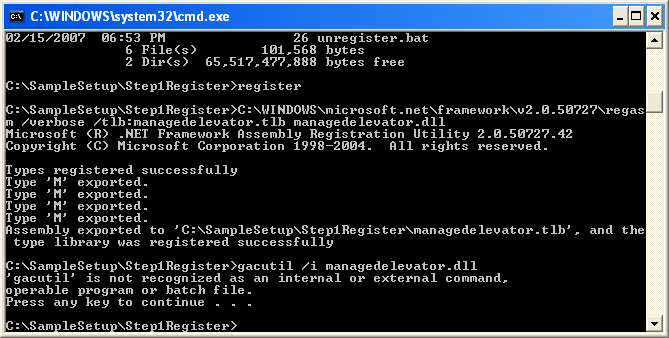 Please take note that when the component is registered on eg Windows XP, no registry entries are written. After all, they are not needed. Not much of a change - it contains the administrative component(s). The guids have been moved to a separate namespace. The reason? That way you can reference the assembly in the client project and use the guids directly - no magic strings anywhere any more. This is the most important change with regards to the POC project - defining the correct ComImport'ed interface is now the responsibility of the implementer of the elevated component. That way, anyone needing access to this component only needs to reference the assembly and they are good to go. It is a bad idea to have this interface part of the client codebase! Actually all it does is encapsulate the necessary calls to UACManager and Marshal. Why is there no if / else using IsUACEnabledOS here? Well, at first I thought I'd build such a switch, but then I thought again: why would I use COM InterOp if I don't have to? I already referenced the assembly for the component (for the guids and interop interface), so why not use managed all the way and save time? 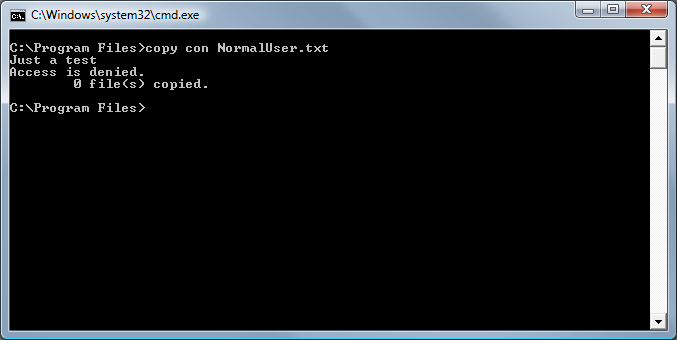 That's what I did in the cmdLaunch_Click event handler. 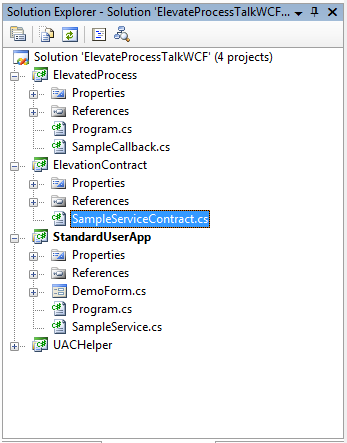 I admit it: UAC Elevation in Managed Code: "Talking" to an Elevated Process via WCF is a kludge. The reason why I dabbled with this approach at all is that I failed to implement COM elevation with managed code (not elevating a COM component, but the COM component itself). However, at long last, I succeeded in that respect too: I now present you the all-managed code solution to UAC elevation! Why this reflection magic? Well, the COM component I am calling here is implemented in .NET - and both VS as well as tlbimp balk at reimporting the exported type library. So how do you go from "standard" "plain-vanilla" COM component to COM elevation? The part that stumped me for so long was the ClassInterface attribute - if you forget this guy, you'll end up with an InvalidCastException thrown by UACManager.LaunchElevatedCOMObject. But that's not quite all to get up and running with COM elevation: in addition, you need to modify the default registration for this component - specifically, you need to configure the DllSurrogate. This is where the AppId GUID comes into play: it isn't used in code (kept there for documentation purposes only), but in registryadditions.reg. It binds the various registry keys. And speaking of this .reg file, please take note of the LocalizedString value: it contains the text for the UAC prompt (also check out UACPrompts.rc, resource.h, compilerc.bat as well as the properties of the ManagedElevator project where the compiled .res file is referenced). Note Before importing the .reg file into the registry make sure to fix the file path contained in LocalizedString! And if you create your own elevated COM component DO NOT reuse any of my three GUIDs - use guidgen.exe to create your personal ones. You will find a file aptly named notes.txt in the ManagedElevator project that describes all the necessary steps to get up and running. I hope you find this sample useful and not have to spend as much time as I did. Cheers! 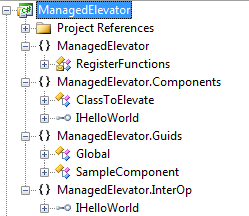 In the blog post UAC Elevation in Managed Code: Starting Elevated Processes I talked about how to start an elevated process. However, just starting a process might not cut the mustard, for example if you need to hand over data to the elevated process. You could achieve this by passing, let's say, some data as command line arguments to ProcessInfo before starting the elevated process. But that seriously limits communication. So how can you perform communication with an elevated process? My first idea was to use .NET Remoting. Once I thought through the multi-instance scenario, I quickly realized that this meant the server had to be running in the non-elevated application, because only it could properly choose a port. And because I am not a fan of Remoting anyways, I decided to give WCF (Windows Communication Foundation, a pillar of .NET 3.0) a try. It looked like smooth sailing at first, but then I realized that with WCF too I needed to implement the service inside the non-elevated application. This time, however, the reason was "How do I know when the elevated application has initialized before I can actually start communicating with it?". Back to the drawing board. The final solution now looks like this: the non-elevated application starts a service. The operations contract specifies a callback, which, once the elevated application has signalled its readiness, can be used by the non-elevated application to "talk" with the elevated application. I didn't intend to go duplex, but hey, if there's no other way I am willing to take plunge. Speaking of tricks of the trade: I am using imperative binding to a named pipe. Reason? 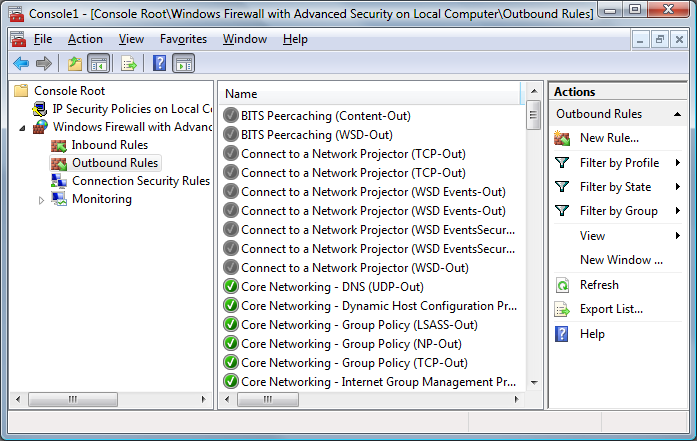 Well, WS bindings won't work (see here and here), and the TCP channel would pop up a firewall warning. That's why. The interface IWaitForElevatedProcess is implemented in StandardUserApp. It is the service endpoint that is initialized before the elevated process is started - and once the elevated application is up and running, it calls into ElevatedProcessStarted. And we are in business for using the IElevatedProcess callback that is implemented in the ElevatedProcess console application. As I said before, I am doing it imperatively (no configuration in app.config necessary). That's all there is to getting the service up and running. That's it - to recap: first, we initialize the WCF service. Then elevate a process. This process, once initialized, calls into our service and leaves a callback. And then we are in business talking to the elevated process (setting data, being notified when the elevated application quits and why, ...). Sample warnings before you download: MyUACServiceHost definitely should be instance instead of static. And, more restricting - starting the elevated process modal won't allow communication unless you start the service on a separate thread. For simplicity reasons I didn't do this for the POC. 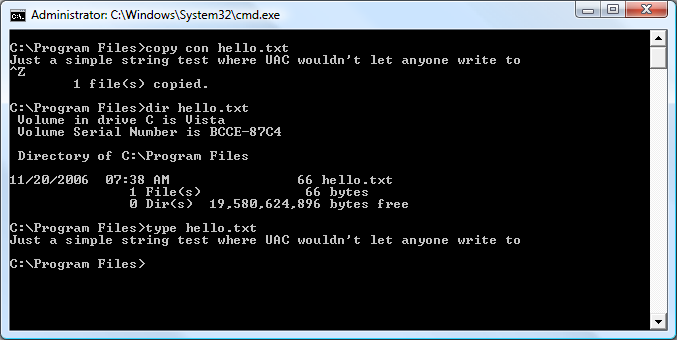 Before concluding I wanted to add a few words: my ideal implementation for UAC would be COM elevation. That way, one can put more than one component into a single DLL, and still get a meaningful UAC prompt thanks to the LocalizedString registry key - which is per component, and not per executable (which is the case for this solution if you add multiple actions). 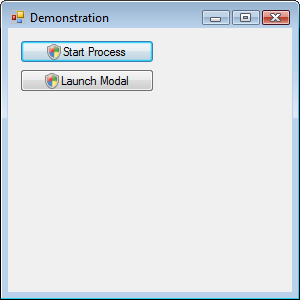 If you need differing prompts for each administrative action, there is only one course of action you can take with processes: create multiple executables. 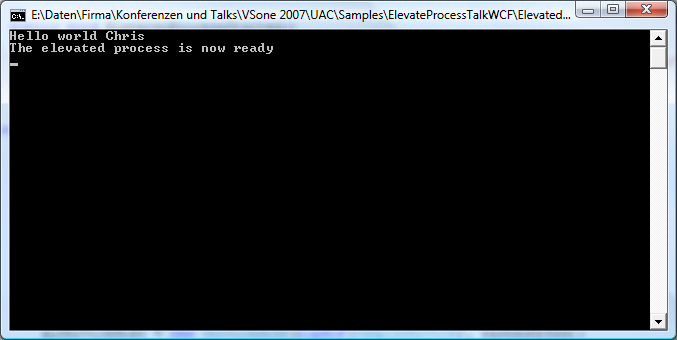 Not very pretty, but I failed with writing an elevatable (not a word, I am sure) managed (C#) COM component. 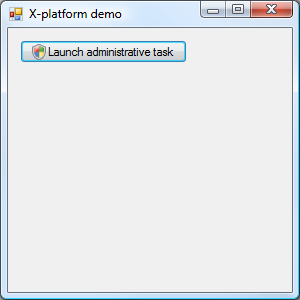 The previous installment UAC Elevation in Managed Code: Starting Elevated Processes dealt with starting executables with the "real" administrative token. In this blog post, we deal with starting a COM component with elevated privileges. For in-depth background information, please consult Kenny Kerr's absolutely excellent post on Windows Vista for Developers – Part 4 – User Account Control. To start with, we need a COM component. 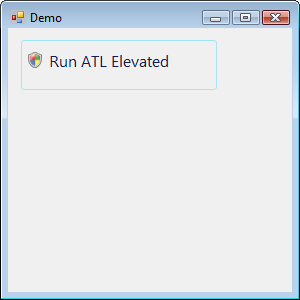 Instead of writing an ATL C++ COM component from scratch, I took the MyElevateCom sample from CoCreateInstanceAsAdmin or CreateElevatedComObject sample from the Vista Compatibility Team Blog. 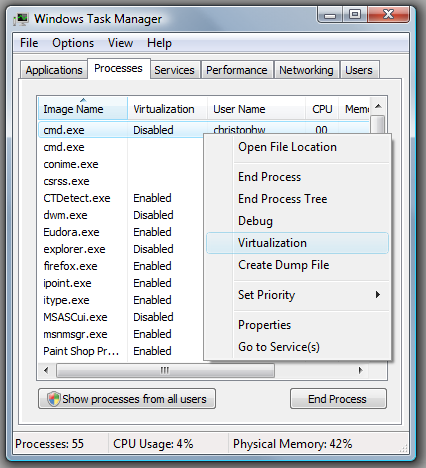 Note that for building it, check out my post Visual Studio on Vista: Not so Fast! Then comes the tricky part - actually instantiating the COM component. When you take a look at the C++ example, you see that quite some "moniker magic" is involved that cannot be replicated by simply newing up the component. So how to mimic this behavior in managed code? 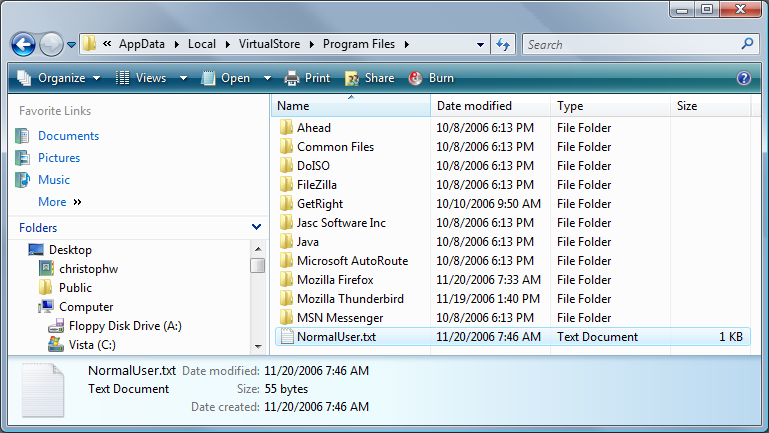 The Microsoft® Windows® Software Development Kit for Windows Vista™ and .NET Framework 3.0 Runtime Components comes to the rescue: inside, you find C:\Program Files\Microsoft SDKs\Windows\v6.0\Samples\CrossTechnologySamples.zip, which contains the VistaBridge sample. Modifications: the method is now public instead of internal, and CLSCTX changed to local server (otherwise it wouldn't work). This button is the CommandLinkWinForms control from VistaBridgeLibary, with the ShieldIcon property set to true. The interface ID as well as class ID guids come directly from the C++ project (it is always a good idea to "speak" more than one language), but you could obtain those from the type library or registry as well if you don't have the source code of the component handy. Object creation is handled via LaunchElevatedCOMObject, and the resultant object is cast to the interface from the imported type library. Noteable (and important) is the last line: because the object wasn't created by the runtime, we have to take care of its destruction (the created interface doesn't have a Release() method, so we use Marshal.ReleaseComObject). That's it - your managed code is now instantiating an elevated COM object that has full reign over the system. 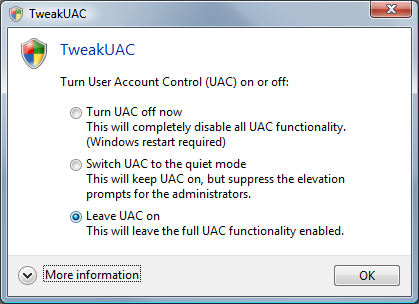 When you are working with Windows Vista, you know that even the administrative users are stripped ("filtered") of their privileges for normal operations, and that when you have to perform tasks requiring administrative privileges, you are presented with an UAC elevation prompt. 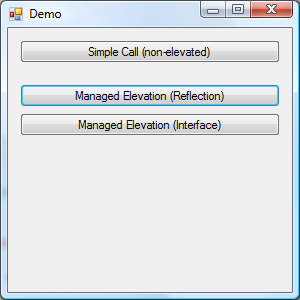 The idea of this blog post series is to provide you with working samples on how to work with elevation from inside managed applications (you might also want to read Windows Vista Application Development Requirements for User Account Control Compatibility). I want to side-step the really easy part - providing a manifest to start the entire application elevated (a good idea if the application makes no sense at all unless it has administrative rights, like regedit.exe). You can find information on those topics in Adding a UAC Manifest to Managed Code and Vista: User Account Control. Now back to the topic of this post: App A needs to start App B with administrative rights (because App B e.g. needs to write to HKLM or Program Files). Therefore, we somehow must run App B as an administrative user (or with the non-filtered token of the current user). So how do we go about it? Those shield icons are stock on Windows Vista and indicate to the user that the action that hides behind the button requires elevation. I didn't create a button control myself - instead, I reused one that is readily available on the Web: Add a UAC Shield to your Winforms buttons in C#. The ticket (so to speak) for the elevation prompt is setting the Verb to "runas" in the ProcessStartInfo instance - this will pop up the elevation prompt if necessary when Process.Start is called. And that's it - App B is now modal. Once App B quits, control is relinquished to App A (which still doesn't run with administrative rights). Got a developer question on how Windows Vista security affects your application? Then the MSDN Forum Security for Applications in Windows Vista is the right place to go. I have been promoting this tool more than once on this blog, so this time just the download link for version 2.1. Come again - spam in Viewstate? What would be the point of this? After some research together with Alex I came across this article: Interesting Crack Attempt to Relay Spam (a more detailed article is available too: Form Post Hijacking). How did I manage to not take notice of this attack vector any earlier I don't know, but I have to admit that the idea is pretty clever. Counter-measures in general? Well, either don't allow users input in the headers at all, or vet the form fields for carriage return / line feeds. Note that I did not verify if any of the available mail components for .NET would be actually susceptible to this kind of attack. This Q&A item is part of the current MSDN magazine's Security Brief's column by Keith Brown. I am pretty sure that this problem will rear its head sooner or later on every developers machine, that's why I am 'pinning' the link in my blog for my own reference too. The Windows Vista Security Guide provides recommendations and tools to further harden Windows Vista. Well, go get it. Now, I am fine with prompting the user to enter administrative credentials. However, I am not fine with providing the user with the name of the administrative user(s) on that machine. In my opinion, this is giving away security-related information without need. Update Of course you can always use net localgroup Administrators to get a list of the members of the Administrators group (Markus pinged me on that one). This feature has been available for ages, true. However, I am not convinced that the UAC convenience of providing the administrative accounts on a silver platter is really necessary. Michael Howard plugged his latest book The Security Development Lifecycle in his blog back in April (A New Book: The Security Development Lifecycle). It isn't yet available in stores, but I decided to preorder because I'm really looking forward to this book. Why? Because it describes a security process in development that works - the SDL @ Microsoft. A /. article pointed me to the blog post Reporting Vulnerabilities is for the Brave. Sounds familiar. Been there, done that. A customer had a Web site, and I told them about a problem. They told their vendor. And the vendor went after me - probably because, like most security-unconscious companies they felt threatened in one way or another. Therefore I wholeheartedly agree with the instructions outlined, plus: lean back, and enjoy when the bad guys whack that company. Yes, this is controversial, but as long as companies don't "get it" that there are people that want to help them when reporting vulnerabilities, it is definitely better to keep your trap shut. Aside from the cynical advice in the above paragraph, here is something to consider for your company: establish a policy - and publish it! - that you welcome security reports by security researchers (and Joe Average for that matter). This goes a long way to getting the threats mitigated before they are exploited. By the way, use this link to search for the video series on threat modeling in the Download Center! Tracking down the URL for the Webcast Detecting and Debugging Common Application Issues Using the Windows Application Verifier really turned into a scavenger hunt today... if you don't know what AppVerifier is, download it here, and read more here. On Tuesday I was presenting a Windows Vista security session, which included UAC (user account control) and respective demos. One part was showing UAC data redirection, and for this blog post I will stick with the registry side of things. Why this redirection in the first place? Well, old legacy applications do tend to assume that you are running as admin on your box. 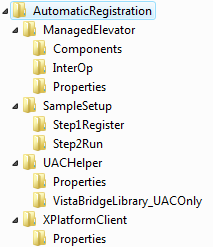 Thus, those apps simply store "stuff" in the HKLM hive of the registry, instead of HKCU. 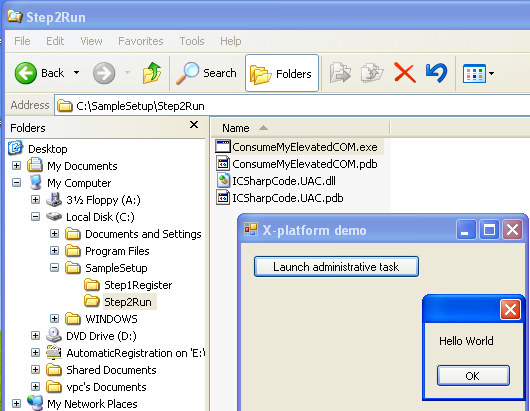 To allow such misguided apps to run on Vista smoothly, UAC automagically redirects write operations from the actual HKLM location to a VirtualStore branch of the current user's profile. So what's your guess where the value will come from - the original HKLM location or the redirected HKCU VirtualStore location? Right, the VirtualStore is the winner. Now, I intentionally picked an existing value in the registry to "overwrite". Imagine somebody writing a "fuzzer" to go over every single value in HKLM and write back gibberish for every value it finds. The original application will now too see this gibberish instead of the original good values. Update Yes, sure, you can turn off this virtualization. Check out the blog entry User Account Control Windows Vista Policies. The process of threat modeling is built on a simple principle: To build a feasibly secure system, one must understand all the threats in that system. The challenge, however, is in making threat modeling more accessible to non-specialists. Microsoft has developed a process through which minimal input can produce a feature-rich threat model that identifies a wide range of critical information including contextual threats, trust boundaries, fracture points, attack surfaces, and direct and transitive access control. This podcast describes and demonstrates this threat modeling process, outlines its benefits, and shows how threat modeling fits into the Microsoft Security Development Lifecycle. The document covers v1 and v2 of the .NET Framework, and it does contain useful checklists. Be sure to grab it! During the MVP Open Day in Munich last week (Friday & Saturday), we had a presentation by Talhah Mir (ACE Team, Threat Modeling blogs) on threat modeling - which (I hope) everyone is familiar by now. During the talk, he pointed us to an interesting resource: A Chronology of Data Breaches from the Privacy Rights Clearinghouse. Quite an interesting list of incidents, which gives you an idea of the ratio of actual hacking vs dishonest insider, as well as other types of security breaches. Aside from disabling UAP, I also went back to THE Administrator account. Doing so can get quite messy unless you join your Vista box to a domain, as outlined in the blog entry Trouble signing on as THE Administrator on 5308? Now I have access to applicationHost.config again. Good security does get in the way, but this is just way too onerous. A reboot later I am a happy (and no longer annoyed) camper. Security obviously went out the window, however, I don't think this installation will live long enough either for this to be an issue. If you need to find out just what devices are running Web services in your network (aside from the obvious Web servers, this includes nowadays printers, access points and many more), then you should check out httprint. It doesn't rely on server banners or fall for other obfuscation techniques, so it is quite handy to find out just what software is running on that box. 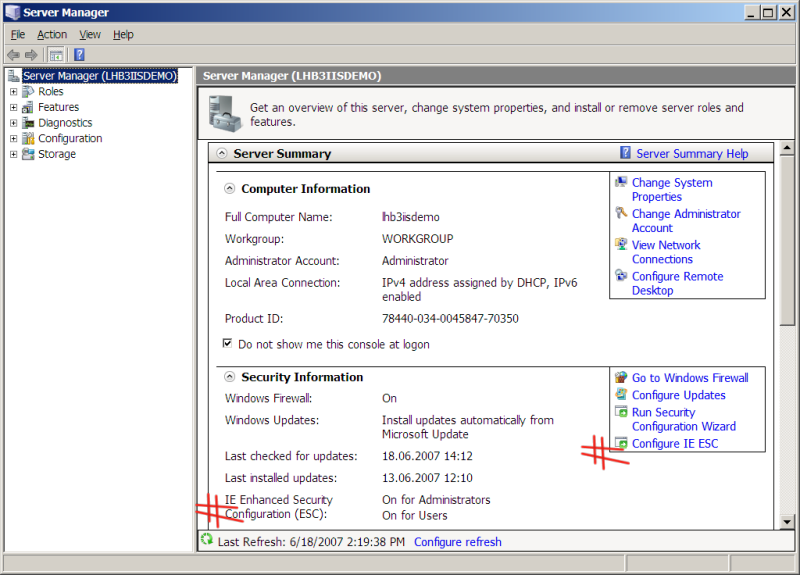 Don't know how this one could slip by me - Windows Server 2003 Service Pack 1 (SP1) shipped a rather important update: you can run SSL in kernel mode (http.sys) instead of user mode. There are restrictions which are detailed here (most B2C SSL sites will do just fine), and the procedure to enable kernel-mode SSL shows how to get up and running in no time. Mostly you are only dealing with the registry key HKLM\System\CurrentControlSet\Services\HTTP\Parameters\EnableKernelSSL. THE security scanner has been made available in version 4.0. Nmap is a tool you should not miss out on when you are in need of scanning networks and hosts. Wired is running a story by Bruce Schneier: Real Story of the Rogue Rootkit. Spot on. David Litchfield published the paper Data-mining with SQL Injection and Inference (more NISR papers). From the abstract: When drilling for data via SQL injection there are three classes of attack – inband, out-of-band and the relatively unknown inference attack. Inband attacks extract data over the same channel between the client and the web server, for example, results are embedded in a web page via a union select. Out-of-band attacks employ a different communications channel to drill for data by using database mail or HTTP functions for example. Inference attacks stand alone in the fact that no actual data is transferred – rather, a difference in the way an application behaves can allow an attacker to infer the value of the data. I admit that I am not the sort of person who likes to go through long and winded installation instructions. However, I am willing to go to great lengths when it comes to security - still with certain limits though. And I hit such a brick wall today: trying to secure Subversion. From the documentation, I knew that the recommended path was SSH, so I set out to find out how to get this up and running on my Windows box. Owning the black sock in Google fu, I came up with various articles, the most helpful being SVN+SSH+public key authentication on Windows Box as server. Most helpful because after reading the aforementioned recipe plus Subversion / TortoiseSVN SSH HowTo, I decided to scratch my efforts. Why? For starters, I am not a big fan of Cygwin. That's just personal mischief of a Windows guy, I can swallow my pride when the tools that depend on it provide merit. What's more of a problem for me is installing a service for adding security to another service - especially if I need that new service just for the "security purpose", and not the other bells and whistles it can provide (plus the security issues that might be hidden in those unused parts). Call me paranoid, but I simply like to reduce "moving parts" in my setups, because: What's worse than malicious traffic? Right, encrypted malicious traffic. Secondly, do you think - honestly - that developers love to jump through hoops to get access to the repository? (I am referring to the client side of things on Windows) Not really. From the top of my head, I fall short of naming a single developer I personally know that would love to follow those steps. But every single one of them would be more than willing to just replace svn:// for svns:// when accessing a repository. Conclusion: yes, I am whining about the usability of an open source project. As I am participating on one myself, you very well can spare me the "usual" arguments of do-it-yourself-because-the-sourcecode-is-available-anyways. This is a rant. I want to be unreasonable. But it sure would be nice if security was in the box. Especially nowadays. This is not just a plain announcement of the revamped German MSDN Developer Center - Sicherheit, it also contains some back patting for myself, so be warned. 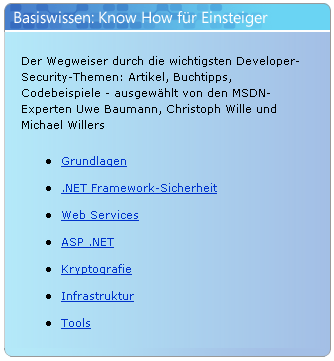 Grundlagen (Foundation), .NET Framework Sicherheit (.NET Fx Security), Web Services (I proposed "Web Services & Distributed Technologies"), ASP.NET and Kryptographie (cryptography, my pet peeve) are the sections that I contributed. Judging from a brief perusal, it seems that mostly only my content is in there. So Michael and Uwe will accept my apologies for me claiming those to be "my" sections. As a long-time subscriber as well as regular reader of the Bugtraq mailing list, I saw Gregory's post on decrypting MSN Messenger passwords. Because that one really piqued my interest, I immediately headed over to infoGreG and grabbed the source code, put it into a VS.NET 2003 C++ project, fixed a couple of compiler switches, and et voila - it works as advertised! From the summary of this security practice: This module presents a set of consolidated practices designed to address ASP.NET version 2.0 security issues. The answers and recommendations presented in this module are tight distillations designed to supplement the companion modules and additional guidance. The practices are organized by various categories that represent those areas where mistakes are most often made. Read about this article on Bruce Schneier's blog. Interesting and fun read, especially early in the morning. Assembler knowledge a plus, but not a requirement. On Friday, it was my turn as speaker at the Community Bootcamp 2005 aka CBC05. One of the topics at hand was "The Provider Model", with a focus on Membership providers. Those are the ones most likely being extended / written from scratch, and we did an exercise in that very area: Extend the SqlMembershipProvider to audit successful and failed logins similar to *nix. The solution I present today is a streamlined solution programmed by Alexander Schoeppl, one of the attendees. Alexander did a smart thing - he looked at the various aspnet* sp's. Done. By the way, did you notice something? Right! Alexander never fell into the trap of SQL Injection. Yet another security book is coming: The 19 Deadly Sins of Software Security. You can read about its contents on Michael Howard's blog here. 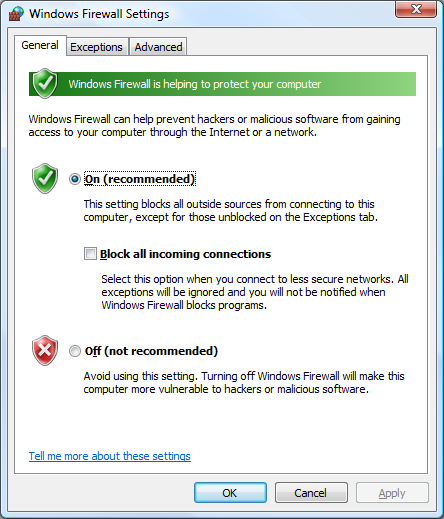 I am not yet done with Protect Your Windows Network : From Perimeter to Data by Jesper Johansson and Steve Riley (great site, btw). I definitely do recommend this book to everyone interested in security! Order a couple of their security posters and place them at strategical locations in your company. Maybe someone should buy this poster for the UK MOD - they keep having their notebooks stolen. Check out the article 10 Immutable Laws of Security on TechNet. A couple of those should get you thinking - I especially like #6. Mark Russinovich (his blog is highly recommended) commented on that book during one of his TechEd Europe talks. The book is written (including) by the guy running rootkit.com, famous for the Hacker Defender rootkit for Windows. Looks like there's yet another book to be added to my backlog for reading this summer <g />. I'm sitting right now in that session. The speaker is just demoing yet another example which has a SQL Injection vulnerability! The killer: a script callback that uses the params unvetted to dynamically build a SQL string. MS definitely should vet the demos for security problems. The new version of MBSA is finally available. Go get it here. A guidance for threat modeling Web applications has been released on the patterns&practices site. A must-read for every Web developer. 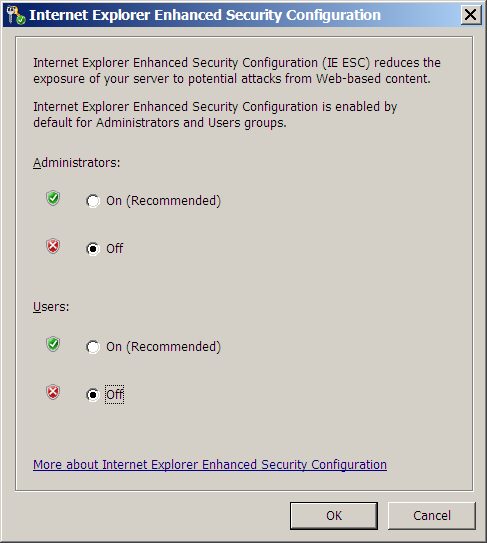 This site contains links to a variety of resources on IPsec and its support in Windows Server 2003. After dinner yesterday, we decided to go to B&N which happened to be nearby. Well, I left with two more books to read: The .NET Developer's Guide to Windows Security and Open Source .NET Development: Programming with NAnt, NUnit, NDoc, and More. The former is by Keith Brown, and contains all those things you usually don't find C# samples for easily: for example, to how to modify ACLs - and much, much more. #cvslib hasn't been a part of the distribution for a couple of years now. However, it played an extremely vital role in #develop's gestation: the GUI for #cvslib was a prototype for the addin system we later used in #develop. Magic Library - in May last year (Fidalgo Beta 1), it was entirely replaced by the DockPanel Suite. Before that, we already had replaced portions of the Magic widgets with Lutz' CommandBar for .NET. All software updates issued since ISA Server was released to manufacturing. Fixes for common issues reported by customers through Microsoft Product Support Services (PSS). Enhanced stability of the ISA Server services and administration tool in a number of scenarios. Also check out the readme. So far, there doesn't seem to be a release readme online at the Web Services Enhancements (WSE) homepage. NNNNNOOOOooooo......! reminded me of one thing I still needed to do to speed up XP on my new notebook: regsvr32 /u zipfldr.dll. In the article The 80/20 Rule for Web Application Security, there is one security solution proposed to protect sensitive cookies: adding the httpOnly flag. This attribute prevents cookies from being accessed through client-side script, thus mitigating the risk of cross-site scripting. That's it - but you are still free to override this on a per-cookie basis. A non-programming security topic centered around securing your wireless LAN. This white paper contains instructions to obtain and install a certificate for PEAP-MS-CHAP v2 wireless authentication on the IAS (RADIUS) server and how to set up the clients to trust this certificate. 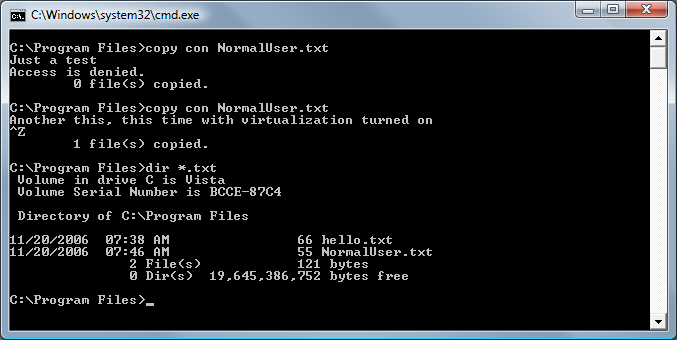 TrueCrypt is a free open-source disk encryption software for Windows 2000 thru 2003 (and this indeed includes XP). 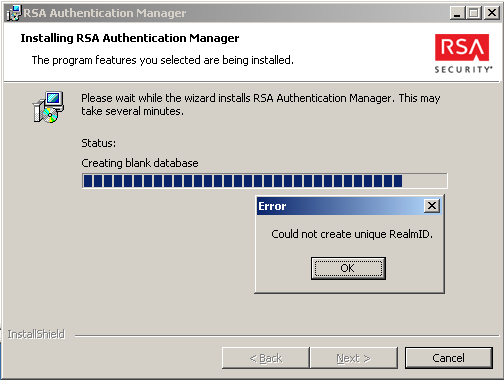 You can create virtual disks, which, as the application name implies, are encrypted: mount with the correct password - you magically see another volume. Don't have the right password? Enjoy looking at gibberish. A recommended application for laptop users, especially the British public (and secret) services should take note as they tend to loose quite a few laptops per year. The second application is KeePass, which is nothing more or less than a nice password safe which keeps your secrets locked away (even from you, should you forget the master key). Cool features: it simply runs (no installation required), has a password generator, and does support importing. There is a new hands-on lab for Web Services Enhancements 2.0: Learn how to secure Web services without writing code. Sample code is provided for both C# and VB.NET, so it should fit almost everyone. 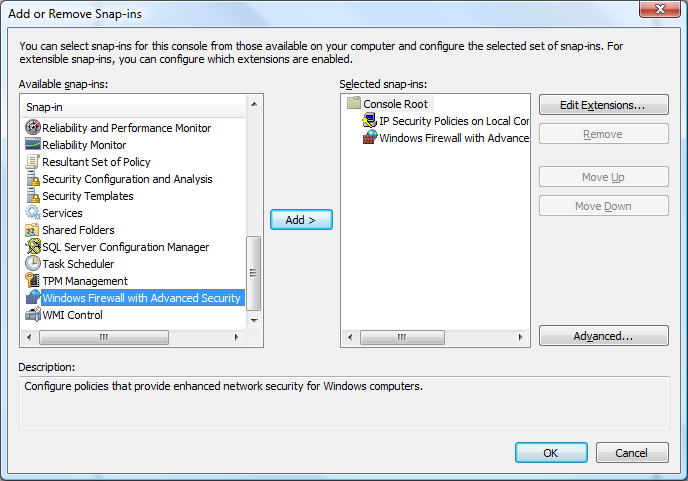 WSE 2.0 SP2 simplifies the development and deployment of secure Web services by enabling developers and administrators to more easily apply security policies on Web services running on the .NET Framework. Using WSE, Web services communication can be signed and encrypted using Kerberos tickets, X.509 certificates, username/password credentials, and other custom binary and XML-based security tokens. In addition, an enhanced security model provides a policy-driven foundation for securing Web services across trust domains. WSE also supports the ability to establish a trust-issuing service for retrieval and validation of security tokens, as well as the ability to establish more efficient long-running secure communication via secure conversations. Tips on securing your PDAs. The audio session is 13:58 minutes long (Flash required). Michael Howard did it again in his latest Writing Secure Code column: how you can run as an administrator and access Internet data safely by dropping unnecessary administrative privileges when using any tool to access the Internet (article on MSDN Security Developer Center). Started using the DropMyRights application immediately on my email applications (yes, I'm one of those devs who does run with administrative privileges by default). Really painless. And can save a headache or two. The November issue of MSDN Magazine is completely about security: attack surface, application lockdown, cryptography, trustworthy code, intrusion prevention and much more. If you ain't already a subscriber, make sure you grab at least this issue at your local newsstand. Michael Howard has an interesting blog entry on the number of advisories for IIS 6 versus the number of advisories for Apache 2.0.x (advisories that are security-relevant, in case you are wondering). This doesn't make Apache look that good after all. Another MSR (Cambridge) project: The goal of the Samoa Project is to exploit recent theoretical advances in the analysis of security protocols in the practical setting of XML web services. Some early outcomes of this research include an implementation of declarative security attributes for web services and the design of a logic-based approach to checking SOAP-based protocols. Even if this doesn't sound interesting to you, the site sports a really great resources section with lots of article links, security topics, bloggers and columnists, resource hubs and more. If you are working with Web Services, check this site out! MS has updated What You Should Know About a Reported Vulnerability in Microsoft ASP.NET with information on the Microsoft ASP.NET ValidatePath Module. This module essentially does what the recommended global.asax fix does - on a machine-wide level. The advantage? Only one install per machine, no developer who could forget to implement the fix, and it also works for applications for which you only have the compiled site. Running on this very Web server. Early Tuesday morning last week, I already had a blog entry up with exactly that title. However, I took it down because Scott Guthrie did ask to buy some time for his ASP.NET team which was already working on a fix for the zero-day exploit reported on NTBugtraq. I changed my entry to Two of the most important security mailing lists, an article containing useful advice– especially programmers are usually not subscribed to these lists, and this I consider to be bordering on irresponsible these days. To get back to the security bug in Forms Authentication: the ASP.NET team has posted a KB article and a security alert. Turn to implementing the workaround options immediately! An IIS best practice using URLScan for the backslash canonicalization issue found in ASP.NET was brought up independently by Stephan on our German ASP.NET mailing list last Tuesday. Too bad that we had to advise lots of people to install a tool that was readily available for years! Bootnote: Hadn’t it been a security vulnerability for ASP.NET, I would have never even considered taking my blog entry down (the ASP.NET team is just absolutely fabulous and their support for the community rocks). I flat-out do not believe that one helps the good guys by not telling them about publicly known zero day exploits (NTBugtraq isn’t just any mailing list after all, and shooting the messenger never was a brilliant solution). This is why the German ASP.NET community knew about the sploit before 7:30AM CET on Tuesday. Even if we hadn’t found a workaround, disabling vulnerable sites would still have been a much better choice than being hacked without knowing. OWASP (The Open Source Web Application Security Project) has a couple of projects online focused on ASP.NET security issues. Current projects include ANBS (ASP.NET Baseline Security), SAM'SHE (Security Analyzer for Microsoft's Shared Hosting Environments), ANSA (ASP.NET Security Analyzer) as well as the ASP.NET Security Guidelines for designing and deploying secure Web applications using ASP.NET (applicable to IIS 5 & 6). Newsforge has an article online which is excerpted from the book Know Your Enemy: Learning About Security Threats (2nd edition), a highly recommended read even for programmers - both the article (focused on honeypots) and then of course the book. Written by a member of the Honeynet Project, this book teaches you how to study a black hat attack and learn from it. In addition, you get valuable insight into the mindset of black hats and their community. I'm talking about NTBugtraq and SecurityFocus' BugTraq mailing list. The former is obviously centered on Windows bugs (including security), the latter is for all operating systems and applications - so there might be too much "chatter" for the average Windows administrator / programmer on that one. However, being on those lists can come in handy when nasty security bugs or even zero day exploits are announced. The patch was available already up front, now the security advisory was published on buqtraq (a list I very much recommend to subscribe to). Cryptography Research put a Q&A online that answers questions around the hash collision attacks that were announced at the CRYPTO 2004 conference (way back in '97 I attended too, wow, the rump sessions were really cool). Authentication and Access Control Diagnostics 1.0 (more commonly known as AuthDiag) is a tool released by Microsoft aimed at aiding IT professionals and developers at more effectively finding the source of authentication and authorization failures. AuthDiag 1.0 offers a robust tool that offers a efficient method for troubleshooting authentication on IIS 5.x and 6.0. It will analyze metabase configuration and system-wide policies and warn users of possible points of failure and guide them to resolving the problem. AuthDiag 1.0 also includes a robust monitoring tool called AuthMon designed at capturing a snapshot of the problem while it occurs in real-time. AuthMon is robust and specially designed for IIS servers removing any information not pertinent to the authentication or authorization process. NeoWin is running an interview with Bruce Schneier, author of books such as Applied Cryptography or the monthly Crypto-Gram newsletter. His answers are interesting as always, I especially liked the ones to the questions "What do you see as the biggest threat in the IT age?" and "Who would you say should bear the burden of responsibility for security?" The book The .NET Developer's Guide to Windows Security is available for online reading in Keith Brown's wiki. It answers seventy-five questions, of which a .NET programmer better be able to answer quite a few of them! So be sure to check it and bookmark the page for your future programming endeavors. The new version of MBSA can be found in the Download Center. Be sure to scan for common misconfigurations on your systems. Identify all known web application security classes of attack. Agree on naming for each class of attack. Develop a structured manner to organize the classes of attack. Develop documentation that provides generic descriptions of each class of attack. Definitely an interesting read if you are concerned about Web site security. The MSR article Why It’s A Bad Idea For Stealth Software To Hide Files had me stumble across a project of MSR, Strider. According to the description, it is "a black-box, state-based, and component-based approach to systems management and diagnostics. The statistical data analyses that we produce and the infrastructures and tools that we build help users manage their systems today and help developers design new operating systems with better manageability tomorrow." Ghostbuster allows you to find rootkits, keyloggers and other malware that hides itself from plain directory listing. How is it done? Perform a directory listing on the infected machine (step #1), boot from a WinPE CD and scan again (step #2), and then compare the two scans (step #3). You'll see immediately what was hidden, and it takes only around 15 minutes to do this - absolutely neat! Closing words: be sure to check out the References section of the article! The book Improving Web Application Security: Threats and Countermeasures (online: Guidelines Corrections) can also be browsed via solutions at a glance. I've been recommending this book for quite some time in the German community, so why not plug it again (and hence start the Security section of my blog).